WHEN the people of Hitchin marched in support of Top Field, the ancient home of the local football club, it was with one eye on a new stadium being constructed on Fishponds Road. It will be six years in December since that memorable afternoon took place, but there has been some movement on the playing fields of Hitchin. New dugouts. When you consider it is not so long since the club installed shiny new floodlights, the ground has not seen such a wave of activity in decades. The old dugouts, built in 1989 by two former stalwarts of ground control at Top Field, John Moon and Richard Bunyan, cost just £ 30 to put together and fix in place. Times have changed – whereas the timber structures were tributes to the DIY prowess of two loyal club workers, the new dugouts are distant cousins of municipal bus stops. But they are in corporation (Hitchin Town) green and look very “continental”, a tag that Brexit-supporting residents of North Herts may not be too keen on. They’re smart, no question, and very contemporary. Given it was £ 30 for 30 years, does that mean that the current structures, costing several thousand pounds, will be in place for several thousand years?, quipped Richard Bunyan over his post-match pint. It was a good day to unveil the new dugouts. Stourbridge, the league leaders, were in town and supping the local ale. Red scarves were seen around Hitchin, which hinted at a large contingent of fans, but they must have got lost, or distracted by one of the pubs in town. 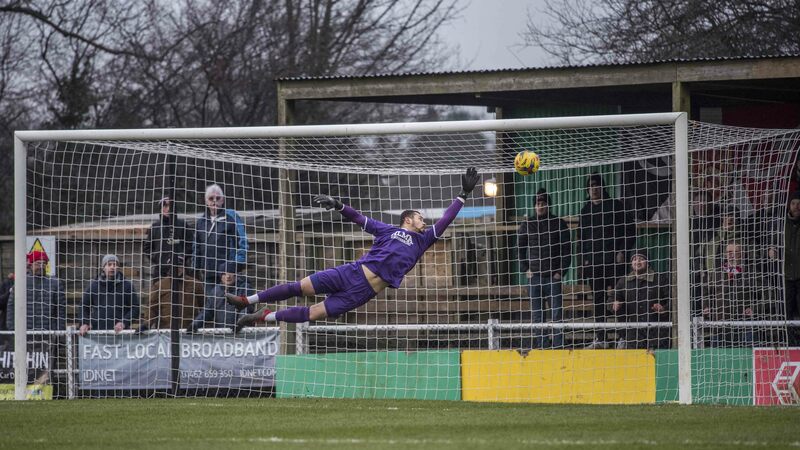 Stopping the rot was the order of the day but the task looked doubly difficult when Luke Benbow accepted a gift and volleyed past Hitchin keeper Michael Johnson. He had no chance of stopping that one. But Hitchin did not collapse and played with more purpose than in recent weeks, with a little more vigour up front. New man Harry Draper (whose name sounds like something out of Charles Buchan’s Football Monthly circa 1956) had a good debut, running hard and showing confidence. Johnson, as ever, was dependable and took care of Stourbridge’s first half energy. Isaac Galliford has impressed in recent weeks, so much so that a couple of Stourbridge fans suggested he would “fit nicely in our team…may have a word with the gaffer”. Hitchin would do well to look after this lad. He did it again in the 35thminute, controlling the ball and hitting it home from close range. Were Stourbridge a little complacent? It certainly looked that way and it was hard to tell which team was top of the league and which outfit had been handed Len Goodman’s “7” when they lost at St.Ives a week earlier. Stourbridge just couldn’t get going, despite bringing on the ominously-named Tommy Tonks (wasn’t there a brand of tough kids’ toys called Tonka?) to add some muscle. Draper netted a second goal in the 71stminute, making it a debut to remember. Memories of the AFC Rushden game were still fresh, but the Canaries held on to win 2-1, thanks to a couple of Johnson saves. The rot had most certainly been stopped. Johnson was the man of the match, but the star performers, as far as shelter enthusiasts were concerned, were those dug-outs. There’s some adjustments to be made, installation of aircraft-style seats with Hitchin crests – we understand – and the obligatory “Home” and “Away” signs, but a new era of substitute comfort had been launched at Top Field. If it all endure as well as the late 1980s handiwork of Messrs Bunyan and Moon, the club will surely be satisfied. Where’s a photo of the new dugouts then?